Babas at the Pashupatinath temple in Kathmandu. Pashupatinath Temple is one of the most significant Hindu temples of Shiva in the world, located on the banks of the Bagmati River in the eastern part of Kathmandu, the capital of Nepal. The temple serves as the seat of the national deity, Lord Pashupatinath. The temple is listed in UNESCO World Heritage Sites list. Pashupatinath Temple’s existence dates back to 400 A.D. The richly-ornamented pagoda houses the sacred linga or holy symbol of Lord Shiva. Legend says that Lord Shiva once took the form of an antelope and sported unknown in the forest on Bagmati river’s east bank. The gods later caught up with him, and grabbing him by the horn, forced him to resume his divine form. The broken horn was worshipped as a linga but overtime it was buried and lost. Centuries later an astonished herdsmen found one of his cows showering the earth with milk. Digging deep at the site, he discovered the divine linga of Pashupatinath. Regarded as the most sacred temple of Hindu Lord Shiva in the world, Pashupatinath Temple’s existence dates back to 400 A.D. The richly-ornamented pagoda houses the sacred linga or phallic symbol of Lord Shiva. Boudhanath is one of the holiest Buddhist sites in Kathmandu, Nepal. The ancient Stupa is one of the largest in the world. The influx of large populations of refugees from Tibet has seen the construction of over 50 Tibetan Gompas (Monasteries) around Boudhanath. As of 1979, Boudhanath is a UNESCO World Heritage Site. 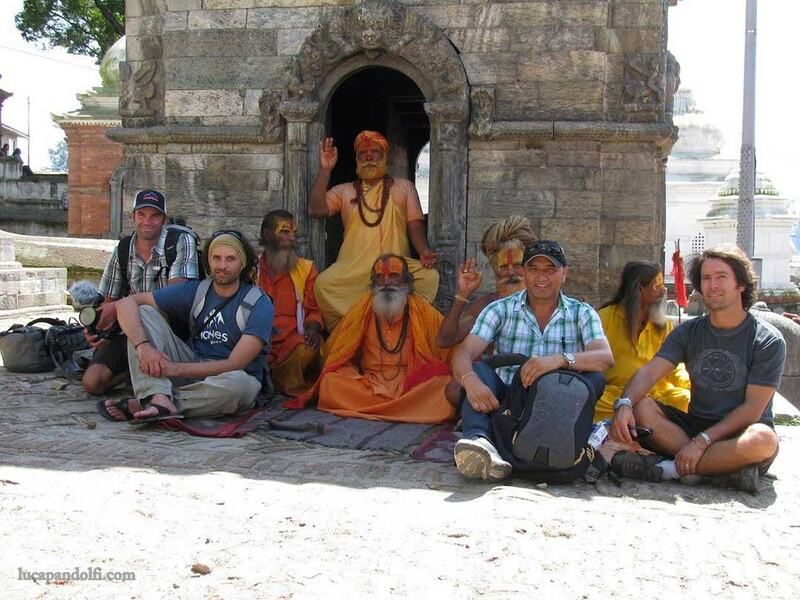 Along with Swayambhunath, it is one of the most popular tourist sites in the Kathmandu area. 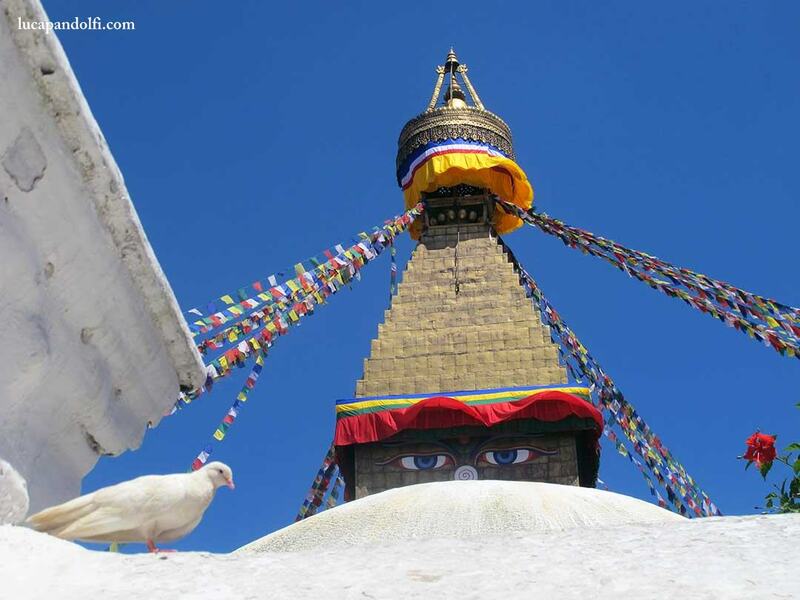 The Stupa is on the ancient trade route from Tibet which enters the Kathmandu Valley by the village of Sankhu. It is with no doubt one of the most powerful places on Earth i have ever been. 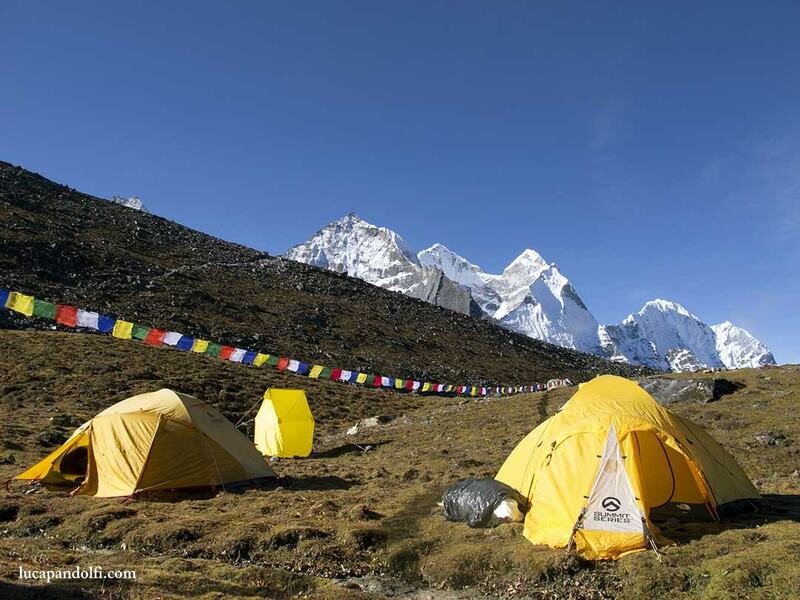 Our Base camp was set at an altitude of about 5000 m at the feet of the beautiful Ama Dablam (6856 m) on its south west side, just below the south west ridge (normal route). 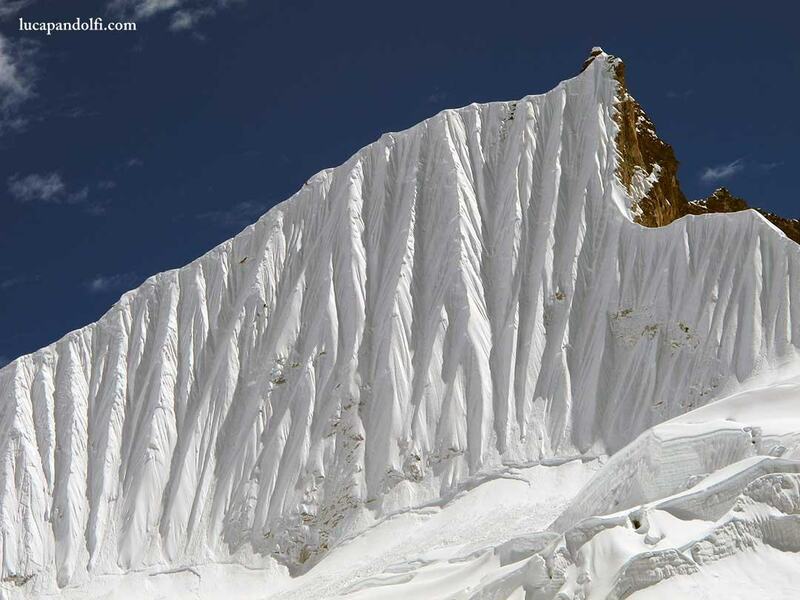 The Shangri – La wall was still pretty far so we had to set up an advanced camp 3 hours walking away. The High Camp was at an altitude of about 5400 m, at the junction of two glaciers and surrounded by what Jeremy called “the Spines Institute”…one of the most incredible place i have ever visited. The base of the wall (in the background) was still 2 1/2 hours far. This entry was posted in News. 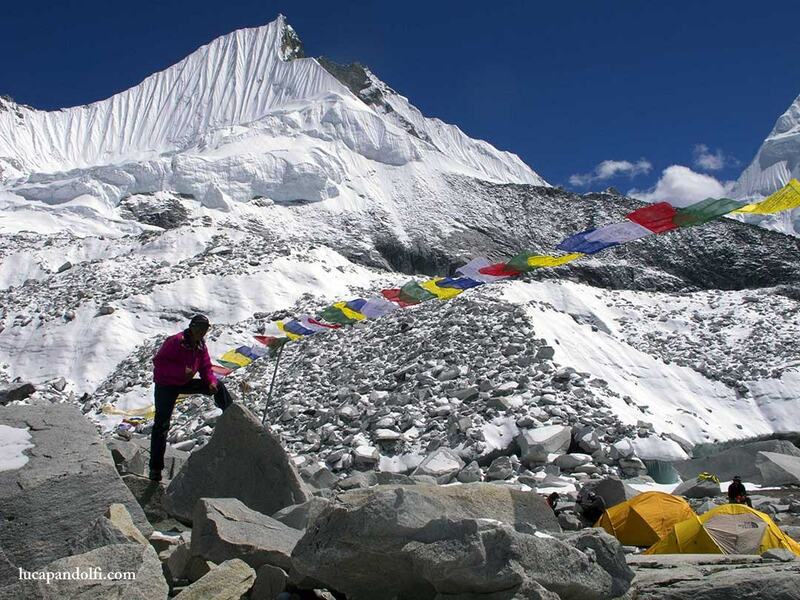 Tagged alpinism, alpinismo, Ama Dablam, Andrew Miller, basecamp, big mountain riding, big mountain snowboarding, buddhism, camp, Chris figenshau, Everest, extreme, fitwell, freeride, ghiacciaio, glacier, healing wheels, highcamp, Higher, Himalaya, hindu, hors piste, Jeremy Jones, jonessnowboards, Khumbu, Lama Geishe, Lotse, luca pandolfi, Matty Moo Herriger, montagna, montagne, mountain, mystycfreeride, neige, Nepal, neve, Nick Kalisz, Now bindings, Nupse, pente raide, polvo, poudreuse, powder, praying flags, ripido, salewa, Shangri La, Sherpas, sluff, snow, snowboard, snowboarding, spark, spine, spines, splitboarding, steep, steep skiing, Teton Gravity Research, tibetan, vertical attitude.